Sweet strawberries and tart rhubarb are a classic pair, made all the better by a crisp, nutty topping. I’ve yet to meet anyone who doesn’t enjoy a fresh-from-the-oven crumble, topped with a scoop of creamy ice cream. Think of it as homemade pie, without all the fuss. You can assemble this recipe in advance and bake it when you’re ready. Serve it straight from the oven. 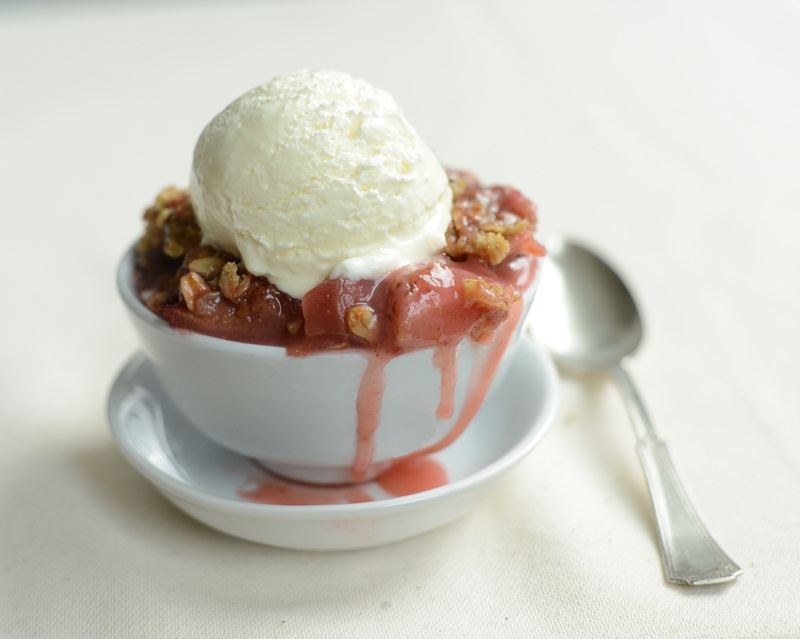 That way, you can enjoy the incomparable sensation of frosty cream melting over the warm fruit and buttery crumble. Feel free to halve the recipe. You’ll need a large baking dish, 3 litre capacity (about 11” x 13 1/2” x 2 1/2”). In a small saucepan, combine the sugar, water, and cornstarch. Stir and bring to a simmer. Maintain the simmer until the sugar has dissolved and there are no cornstarch lumps. Remove from heat. In a medium bowl, whisk together the brown sugar, salt, flour, ginger, and cinnamon. Add the butter, oats, and nuts, and combine using a fork, pastry blender or your fingers, until the mixture is crumbly. Line a large baking dish with the rhubarb and strawberries. Pour the sugar mixture over the fruit. Top with the crumble mixture. Place on a parchment-lined baking sheet. (This dish will bubble over. ) Bake 30 – 40 minutes or until the fruit is tender when pierced with the tip of a knife. Serve immediately, topped with ice cream.